Descend into the thrilling world of vampire Amelia and her quest to retrieve the Hidden Treasure, with this online video slot game released by NetEnt. Blood Suckers 2 is not only packed with high definition graphics but also benefits from a soundtrack so eerie that it transports you right into the world of vampires and their riches. The layout is made up of 5 reels and 3 rows. Winning consists of completing any of the 25 betting lines. To start the winning spree, you need a minimum bet of €0.25. Three or more Scatter Symbols trigger 10 Free Spins. While in this Blood Rose Free Spin, all bet lines and scatter wins are multiplied by 3. Entering the Hidden Treasure Bonus Game requires 3 or more Bonus Symbols on neighbouring lines. 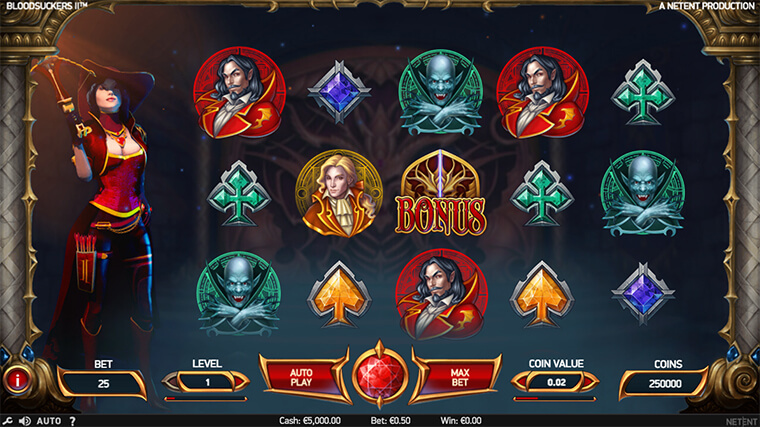 If 4 Bonus Symbols turn up, then all winnings in this bonus game are double. In the case of 5 such symbols, the winnings are tripled. A special mention goes to the strong narrative supporting this video slot game. The story of Amelia and her journey to retrieve the Hidden Treasure, stolen from her ancestors by vampire hunters, becomes a Special Feature, turning this game into a world in itself, a world into which the player can immerse himself completely. You can expect a return to player (RTP) of 96.94% and medium-high variance.